Jasmine is a CIS alumna who is surviving and thriving against all odds. She was placed in the foster care system at 5 years old and continued to be a ward of the state until her grandmother assumed custody a few years later. Jasmine is a resilient young woman who’s overcome many barriers: she struggled to complete middle school and found herself struggling in high school as well. 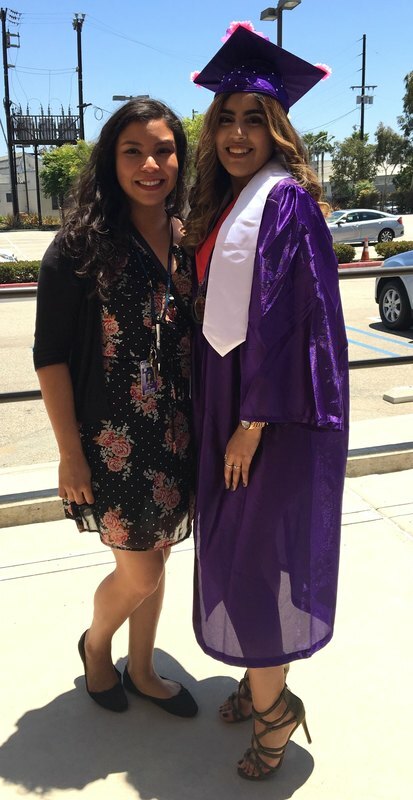 Jasmine met Amy while attending Manual Arts High School in South LA. Amy is a CIS site coordinator and professional social worker who believed in Jasmine. Amy became someone Jasmine could confide in, cry with and celebrate her accomplishments with. Amy helped Jasmine see that her struggles in middle school did not make her destined to fail and she worked to provide resources and services to get Jasmine back on track. By her senior year, Jasmine was on-track to graduate and Amy helped her navigate her options for college benefits through programs designated for former foster youth. Last spring, she was accepted to several universities. Asked about her relationship with Amy, Jasmine said, “She has honestly been an amazing mentor and continues to inspire me to be a better student and person.” For site coordinators, being the caring adult in the life of a vulnerable child is the most important part of their work. Amy explains, “Students like Jasmine motivate me. I see them struggle and continue to press on - it’s inspiring! My relationship with my students is important to me; it refuels me and keeps me motivated to do this difficult and critical work. Students are looking for adults who will take the time to listen to them, help them process their feelings and guide them to the resources they need post high school. I am proud to be that person for my students." Today, Jasmine is the first person in her family to get a high school diploma and go to college. She is attending Los Angeles Community College and eventually plans to transfer to a four-year university. She is currently looking for an internship to pursue her goal of becoming a social worker one day, to support foster youth like herself.